On this episode of Viewers Rigs we hook up and talk yaks with The Wizard himself, Romel Labrador from Team Nucanoe. Romel does a lot of custom rigging on his boats as well as a few others in the community. He is the man behind the Titan 13.5 One Man Bass Boat and Greg Blanchards Bixpy Jet install. If you want to see from Romel check out his Youtube page. A window into our 2018 Paddlefest. A community party based around the common love for paddle craft and being on the water! So if you want to enter here is the deal. Guess the length of the top 3 winning fish to win! Once the winners are announced on Yak A Bass, I’ll post that in the comments and reach out to the winners for email addresses and shipping info. Thanks for watching and being a part of the Headwaters community. We appriciate the support and good vibes. Keep em coming! Headwaters Fishing Team member Ernie Williams had a few days off for spring break and he didn’t want to waste the good weather. 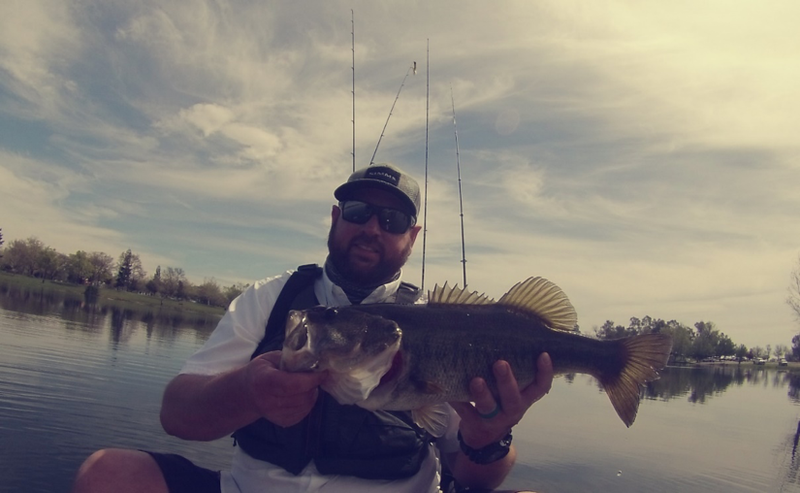 He was able to get out on the water a few times to Rancho Seco Lake. Ernie’s Jackson Big Rig all decked out! Ernie’s home lake is Rancho Seco and with the full moon coming he went out looking for bed fish. He was not disappointed. He went out Wednesday 3/28/2018, Friday 3/30/2018 and Monday 4/2/2018. Ernie’s son landing a bass from the bow of the yak. He saw lots of males on bed with very few females. 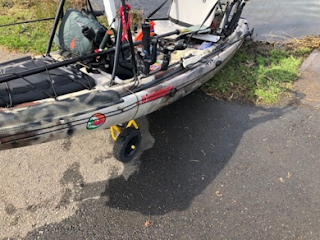 He was able to work the shoreline keeping his kayak in less than 9 feet of water, standing up in his Jackson Big Rig looking for bed fish. When he came up to a bed he would drop his drag chain and then stake out with his YakAttack 8 foot ParkNPole. Most times he could see multiple beds to fish for without having to change location. He quickly learned that if he came across a male that was committed to defending its bed, he could catch it with in the first 12 casts and did not need to spend more than 15 minutes working one fish. He had a feeling that the females would be coming up to join the males soon, so he went back out Friday. Ernie Came across a pair of females and was able to catch one. The second female Ernie encountered was further from its bed. He worked at it for over an hour, but he could not get the male or female to bite. Ernie frequently brings his son along with him fishing. 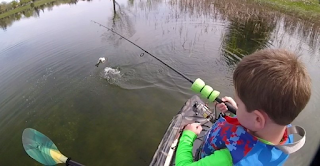 His son was able to catch three males off their beds from the front of Ernie’s kayak. Ernie’s selection of baits for Rancho Seco. Fishing was much more difficult after the weekend. Locations that had many beds with males on them just days before were now ghost towns. He worked the shore line looking for only males. He found one and was able to catch it before the wind came up making it difficult to locate fish. 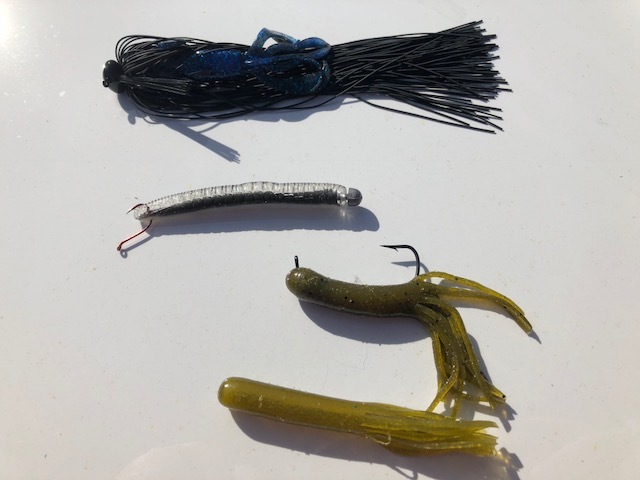 Soft plastic tubes, Neko rig roboworm ned baits, and mop jig was his bait, but a jig, Texas rig worm or senko would work too. He had a swim bait rigged up, but without females he didn’t throw that very much. A nice fat Ranch Seco Bass. Greg Blanchard teams up us again for an on water comparison review of the full Native Watercraft Titan Range.